As a little girl, Brenda Stumpf wanted to be an archaeologist. This impulse worked its way into her art-making in her thematic fascinations, methodical practices, and scavenger hunts through our material culture and civilization’s archive. Rather than excavate, Stumpf crafts her own cryptic artifacts that address us like objects from another time. The artist puts on the bygone mantle of painters and sculptors, invoking a spiritual power beyond visible things. In Seshat, Stumpf summons the ancient Egyptian goddess of writing and record keeping, architecture and mathematics, astronomy and astrology. Known by the epithet “Mistress of the House of Books,” Seshat maintained the House of Life, a library containing the sacred books, and recorded the achievements and victories of pharaohs. Since the Old Kingdom, scribes were a powerful class in a society in which knowledge and belief were intertwined. The mortal and the eternal, the earthly and the cosmic, became one through potent rituals and hieroglyphics. The nine artworks that comprise Seshat have a strange beauty. 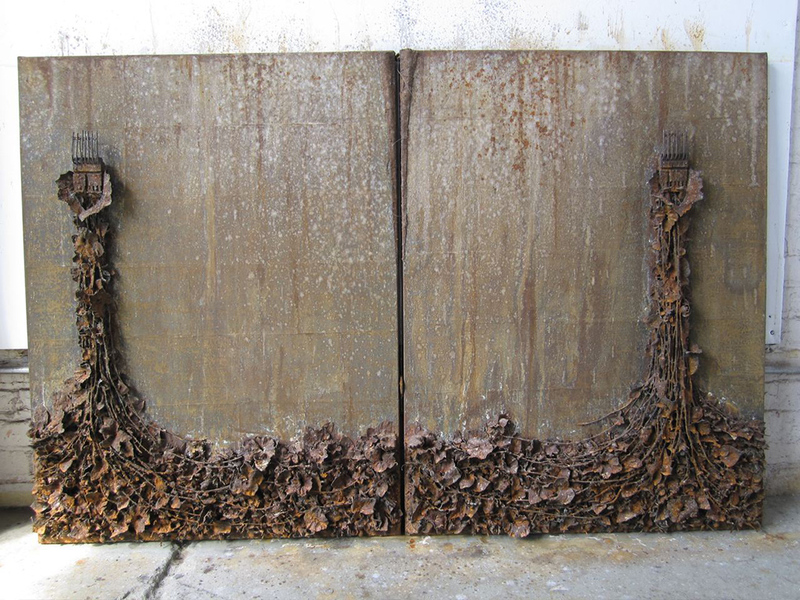 Assemblages or found-object constructions, they seem at once both organic and metallic, wall slabs or sculptures that grow until they are frozen. Panels incorporate outdated women’s undergarments, slips ripped open with floral elements in relief either growing up into or tumbling out. The resulting form of massing at the ground and tapering to a point is echoed in a free-standing sculpture. Birds’ nests form a fanciful stairway. Tiny hands emerge from another dimension. Crevices beckon with the lure of mystery off-stage or beyond. The implied movements up and down or through layers engender a feeling of stilled life induced by an enchantress’ spell. Starting with ordinary objects, Stumpf transformed them “beyond what they were.” She collected things that had another life and created arrangements in which they built upon each other. The initial find was a collection of old law-book covers, which became the carefully constructed surface. Plastic foliage, piano parts, and pearls became elements of an intricate visual puzzle; doll hands became enigmatic and rich with associations. All are unified and defamiliarized by a near-monochromatic color palette suggestive of rusted metal, making the artworks appear like relics. The feeling of metamorphosis in combination with the transmutation of materials references the ancient practice of alchemy — the quest to turn base metals into gold. With various traditions and a deep history, alchemy was determined in medieval times to trace back to ancient Egypt, specifically Hermes Trismegistus and The Emerald Tablet. Some claimed that he was the incarnation of Thoth, the Egyptian god of magic and writing who was conflated with his Greek counterpart, Hermes. Identified alternately as his daughter, sister, or consort, Seshat was displaced by Thoth and her priestesses served him; but the goddess was the primal, female force at the root of alchemy’s distant origins. Near the Denver stockyards in an old creamery building, Stumpf’s studio served as a chamber for her creative alchemical process. Placing her elements in tidy baskets, Stumpf worked painstakingly and systematically for a year and a half on Seshat. Over time, the investment of concentrated activity created a kind of energy, which itself connected with the scribe archetype. Just as a scribe writes a sacred book as an act of devotion, Stumpf meticulously placed each piece even though it might later be obscured or disguised. Using old law books for her surface made for a kind of palimpsest, a scroll or book that is used over again and new text written on the parchment or vellum. As a young artist in Ohio, Stumpf worked with an iconographer, who painted Byzantine icons, which required a measured working method and a precise application of gold leaf. 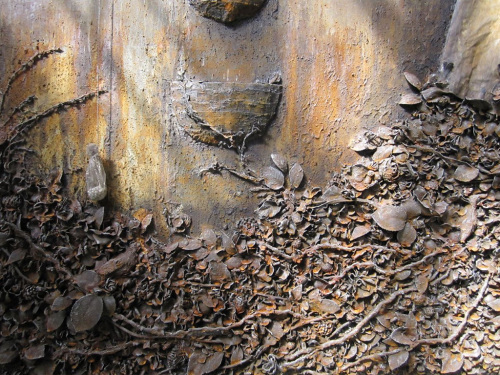 The sculpture Chrysalis includes one gold-leaf medallion among the rust-colored ones strewn at the base, almost as if the alchemical transmutation worked. All the artworks have a feeling of oxidized iron or lead, which speaks of a profound and reactive change to substances, of the earth, through the fire, touched by air, hastened by water. Whereas the alchemist worked covertly or the scribe worked in isolation, Stumpf documented her project’s development in photographs and placed them online. We get to see the stages of making, which makes the completed works seem all the more hidden. Each layer could be a complete work unto itself; yet out of each, another materializes, a sequence distinguished by different color schemes. Alchemy is shrouded in symbolism within which color transition references both a chemical and a spiritual process of purification. An essential concept of alchemy and other hermetic studies, such as Rosicrucianism and Freemasonry, is Hermes Trismegistus’s principle: “That which is Below corresponds to that which is Above, and that which is Above, corresponds to that which is Below, to accomplish the miracles of the One Thing.” Blackness (nigredo) embodies the prima material or chaos out of which all things come. Behind the black is the light of the soul, a whitening (albedo) that result from the purging of impurities. At times before the white appears, multiple colors can be seen, which is referred to as the peacock’s tail. The last phase is the reddening (rubedo), the unification of man with god, the limited with the unlimited. As an artist and not an alchemist, Stumpf is not literally enacting the alchemical process but is working intuitively in accordance with its system of correspondences. Within the hermetic tradition, the secret lore of Egypt was a valuable source of wisdom, even though refitted for an eclectic intellectual milieu. The sacred writings were grafted onto Christian belief and Greek philosophy, while the very nature of the writings themselves provoked curiosity and emulation. A fifteenth-century discovery of a fifth-century book, the Hieroglyphica, took hold of Neoplatonic thinkers in Renaissance Florence, because the pictorial writing aligned with their own symbolic thinking. The world of appearances veils a higher truth; as incarnate creatures, we require signs to reach a spiritual state. Hieroglyphics-inspired Emblem books offered pictorial images that depicted a concept, motto, or allegory. After the Reformation, emblems became even more widespread, given the Protestant iconoclastic distrust of “idolatrous” representation. From the sixteenth through the eighteenth centuries, artists created elaborate emblems full of marvelous conceits, premier among these were prints based on alchemical allegories. Enigmatic distillations, the emblems expressed the alchemists’ central principle of the correlation between the microcosm and the macrocosm. Situating herself in the hermetic tradition, Stumpf says, “Seeing becomes a trigger.” She puts together an intriguing mix of iconographic elements that resists narrative but suggests meaning. The slip certainly manifests the female, which can lead the mind to other associations. The stylized female form can also allude to a mythological figure or archetype surrounded by identifying attributes, such as the Baroque sculptor Bernini’s Daphne turning into her namesake tree. Stumpf acknowledges her use of natural motifs but emphasizes that they are signs: “Thought becomes form.” Flora and foliage are often found in emblems, and in the Seshat panels they are vigorous and abundant like the contents of a cornucopia or a lush garland. Emblematic devices often are suspended in the sky or piled on top of each other, defying a simple spatial reading. 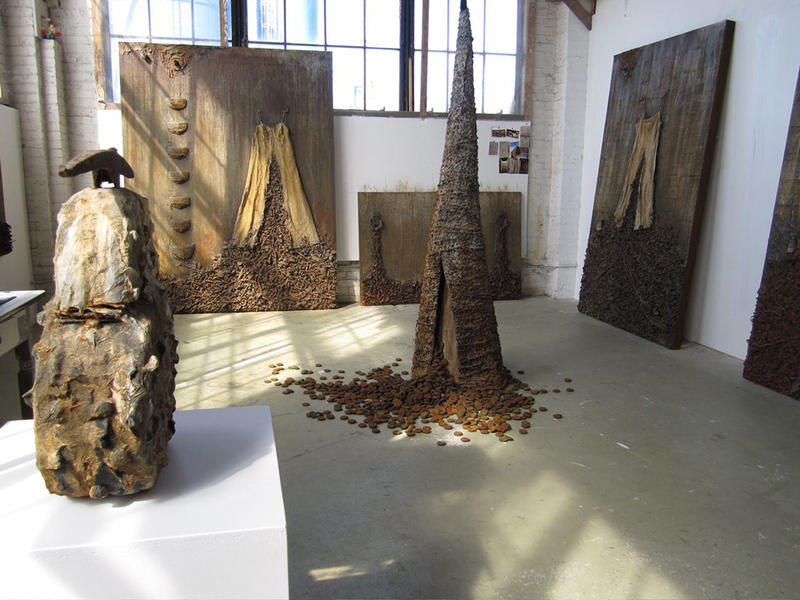 In Stumpf’s sculptures and relief paintings, such forms are material and come out into our space, which has an eerie quality, as if we could enter or be pulled into a supernatural beyond. Unlike traditional emblems, Stumpf’s use of imagery is personal and open-ended. She looks for a higher meaning but also an inner one. As a vehicle for personal transformation, the psychologist Carl Jung and the medical intuitive and mystic Caroline Myss turned to archetypes and alchemy to access psychospiritual forces. The very hours working with her hands in simple activities engaged the artist in a meditative practice that affected or disrupted ordinary consciousness, and the artist’s handiwork speaks of a longing for a vanished time. In the eighteenth-century, Romantic philosophers, poets, and artists railed against the tide of empiricism and industrialization. Rather than reason, they championed the power of imagination and feeling as a way of knowing. 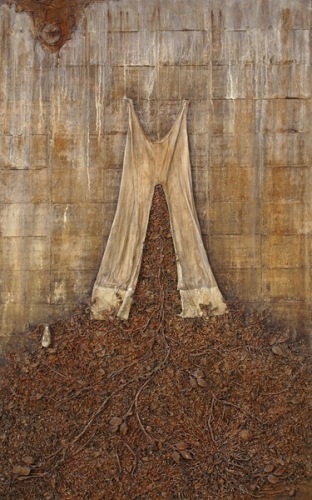 A contemporary Romantic, Stumpf created a drama in which nature triumphs over machines. In Seshat, we feel magical forces subverting order or inhabiting mechanisms and devices. Some sort of boundary is breached. The scribe archetype in the form of the goddess Seshat comes from a shadowy place within the artist and perhaps the viewer. Working in the space between, Stumpf welcomes what she optimistically sees as the passing of the Age of Reason.